After our trip to Disneyworld in 2016, then New-York in 2018, we will be back to the USA next summer. It will be our last trip abroad as a family of 4, because in 2020 our son will be in college, he won’t have the same holidays…and we will be broke because of his college fees!!!! 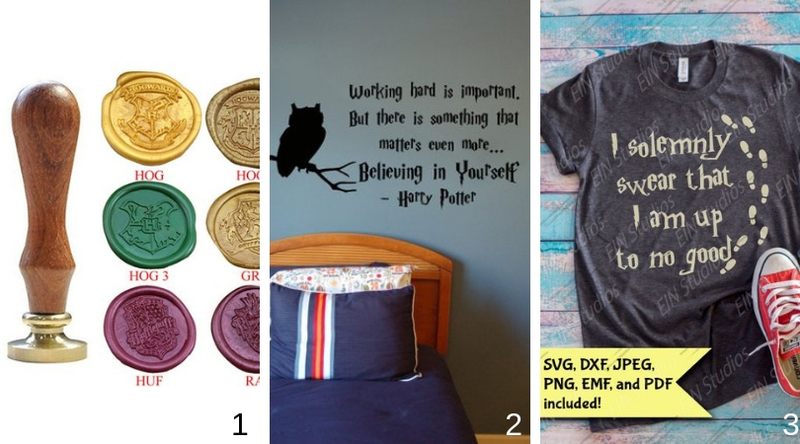 I think it would be cute to have some nice Harry Potter-themed stuff beforehand. It’s obvious we will buy souvenirs at USF, but I found nice things online. 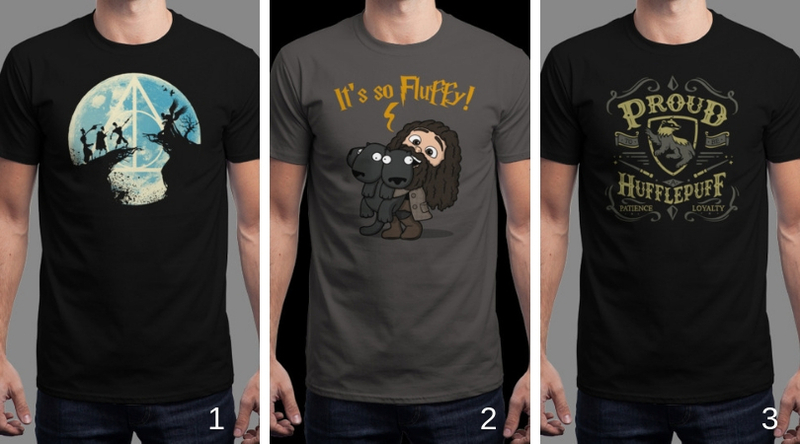 Son and husband are both great fans of the e-shop Qwertee. My son has 2 dozens at least of tees of various designs. I love them BUT unfortunately my hips don’t fit 😥 ! Every day there 3 new designs at bargain price. Earrings!!!! You know my love for earrings. I don’t usually wear earrings during school days, but when we’re invited, it’s just the moment I choose to wear fun earrings. 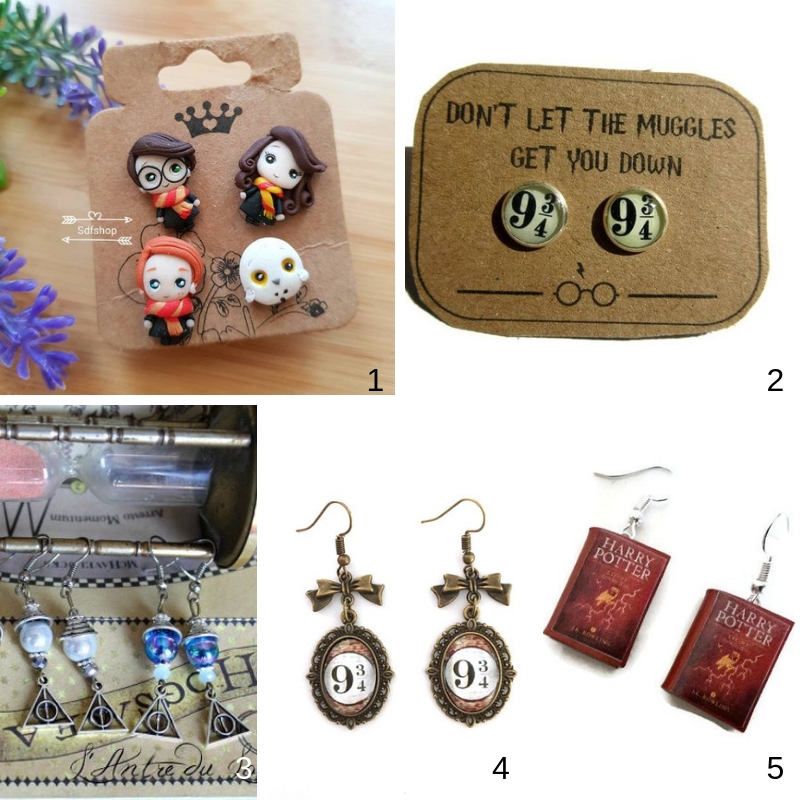 Etsy offers a wide range of cute Harry-Potter inspired earrings. When the weather is colder, you will be happy to have socks with your favorite characters on them!!! I do love socks (at least, as much as I love earrings!). I have started a cute collection of funny socks when in Disneyworld. I have Minnie, Cheshire cat, Magician Mickey socks!!! Thus I need some Harry Potter socks…! Saved by Amazon: a black beanie with only the house crest showing!!! There are plenty of duvet covers available. Some are rather childish, but others are really nice. The downside is that, in France, they are mostly meant for one-person bed…so saaad! I want a Harry Potter’s duvet cover!!! We are on a craft blog, aren’t we??? However, it’s funny and cheap so we might give it a try. Since I own a Silhouette Cameo (and don’t really use it), I thought that I could cut some HTV or vinyl. There are a lot of SVG files available. I also like the idea of stamped letters. It’s so old-school!